To be more precise, our services includes Safest Storage, efficient Cross-Docking and effective maintenance of Stocks. We provide warehouses within or near by Airport and Seaport worldwide. Commercial / Household, Export / Import, Manufacturer's goods-in-process and retail supply items to stock and distribution to our customers with safe mode. Well-tuned cross docking system is present for quick unloading of materials from an incoming semi-trailer truck or railroad car and loading them directly on to outbound transport, with little or no storage in between. This ensures up to 10 times faster delivery even in the peak hours and on urgent basis. We own and operate a comprehensive workshop which offers sophisticated packing services to customers. Packing of all small and large products, etc. is done with care, professionalism and quality packing materials. The term cross docking refers to moving product from a manufacturing plant and delivers it directly to the customer with little or no material handling in between. Cross docking not only reduces material handling, but also reduces the need to store the products in the warehouse. 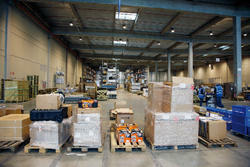 There are various warehousing services that are co-operative. These services deal with the transportation, logistics, road- transportation and shipping of the goods. Capricorn’s cross-docking solution ensures that your products flow directly from inbound to outbound within your DC, and save you costs incurred on storage and other warehousing activities. Cross docking will dramatically reduce your distribution cost and expedite your delivery time, and is especially helpful with product consolidation.